Her unusual birth gives her the unusual ability to speak with animals, but unfortunately not with anyone else. She is blissfully happy living in the warm and wonderful waters of the island, absolutely at ease with her animal friends – monkeys, dolphins, seagulls – but unable to speak. Her family manages to escape the island before a terrible spell takes hold and keeps them prisoner there forever, but Acqua Dolce remains mute and struggles to adapt to life away from the island, away from her animal friends, and out of the water. 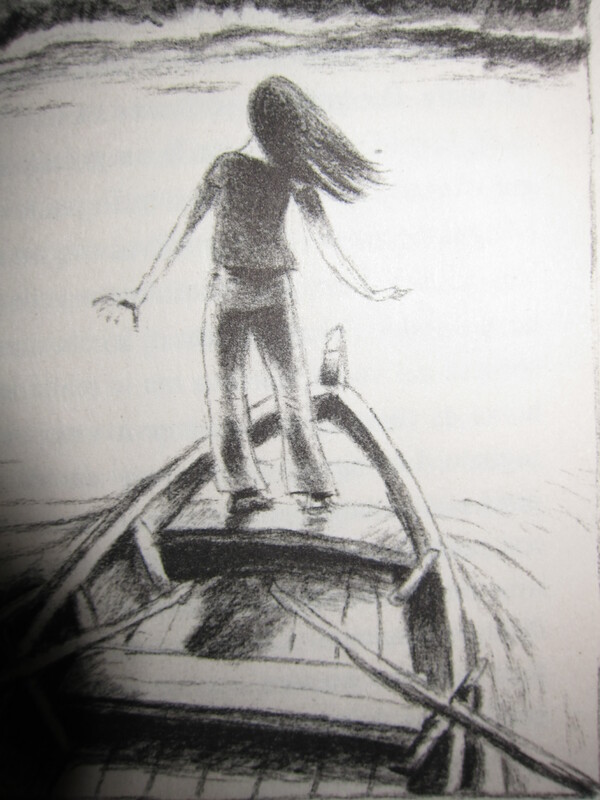 A chance encounter with an old fisherman brings Acqua Dolce to a turning point in her life. Listening to the old man’s stories, she realizes that the key to her future may lie in a mysterious half-moon necklace brought back from the island. But Acqua Dolce must be brave enough to unlock the mystery and go where it may want to take her. And if you want to know what happens to Acqua Dolce, the people she meets along the way, and the friends that go with her, then please share this taster in the hope that it might generate enough interest in the book so that this blog will not be the last stop on its journey into English, but simply an important one along the way! In the meantime, here’s a little taster. So, Acqua Dolce is a modern fairytale in endearingly clean language. It combines a deceptively easy third-person narrative with the kind of comic adventure that makes all children laugh. The story lends itself perfectly to reading out loud by an adult and even hesitant early readers will have no trouble making their way through their first full “chapter book” thanks to the air-light prose. The same laugh-out-loud mix of hilarity and adventure can be found in other contemporary successes, such as Flora and Ulysses by Kate Di Camillo, Dear Scarlett by Fleur Hitchcock, and Pandora’s Key by Nancy Richardson or even in classics the likes of A Journey to the River Sea by Eva Ibbotson or Philippa Pearce’s The Midnight Garden. If we’re looking to classics to compare it with, then the mind also goes back to Charles Kingsley’s The Water Babies, in which Tom becomes a water baby and discovers an aquatic playground full of strange and wonderful characters. Acqua Dolce shares elements of all of these, but what makes Bouchard’s modern tale different is that he has written it for the younger reader in an easier register. Early solo readers are carried to exotic places, laughing as they learn important lessons about life, but without anything rude or crude unlike many other books currently offered for their age-group. Bouchard writes simply to make children laugh in a clean, unaffected way. By knitting a gentle morality into a genuinely nice tale, and giving voice to a range of genuinely nice but eccentric characters, children are drawn in to an adventure that leaves them feeling good about life. In the end, nice things can actually happen. Acqua Dolce http://www.acquadolcedolce.info/acqua-dolce/ was first published in 2008 and has been reprinted six times. In 2010, it won the Rome Libraries Award for Children’s Literature in the 8-10 age group. It has just been selected by ICWA http://www.icwa.it/ – an association of Italian writers of children’s books – as one of 10 out of 100 stories to be promoted for translation into English.